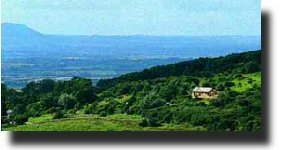 All the main rooms provide panoramic vistas westward across the Severn Vale to the Black Mountains of Wales and southward as far as the Severn Bridge. Walks start within a few feet of the front door with Nottingham Hill, an Area of Outstanding Natural Beauty, rising above the cottage. Within a quarter of a mile is 1000 feet-high Cleeve Hill with its golf course and ancient earthworks Beyond are the Cotswolds with their picturesque villages and stately homes. Only four miles away 15 minutes drive is Cheltenham with its superb Regency architecture, stylish shops, annual Music Festival and famous Race Course. Set in its own four acres of unspoiled meadowland, the Old Dairy is a carefully restored stone-built dairy dating from the early 19th century. There are three double sized bedrooms. Downstairs is a large bedroom with a double bed and en suite bathroom with shower & bath. Between the upstairs bedrooms is a second bathroom, with a shower.